The ‘suspension’ is building for our upcoming Vancouver trip! -suspension bridge that is. 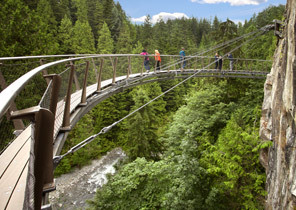 While in Vancouver, Gerry and I will visit the Capilano Suspension Bridge Park. 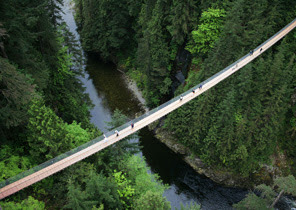 It hard to believe that the bridge has been around since 1889 and stretches 450 feet across and 230 feet above the Capilano River, and is just minutes from the busy city. While at the park we will also take part in a Treetop Adventure. It is the one of a kind attraction, and offers a squirrel’s eye view of the thriving coastal forest. Visitors venture from one giant Douglas tree to another, taking in the breath taking scenery. It is a great thing for people looking for a little bit of an adventure, done in a perfectly scenic and safe way. 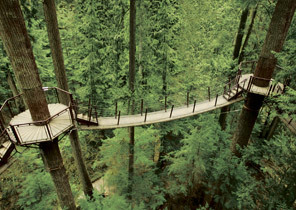 Those looking for more excitement can, just like us, check out the Cliffwalk at the Capilano Suspension Bridge Park. In this adventure you can take a trip through the rain forest on a cantilevered and suspended walkways jutting out of the granite cliff face and overlooking the water. In some sections of the walkway you are standing on glass giving you a beautiful and maybe scary view of the forest and river down below. We can't wait!! I AM kind of "iffy" about heights but I'm determined to do this and something to add to the Bucket List! My mom did this with my eldest daughter years ago...they loved it! I found it a scary thing to do. Have fun. You could check out Gastown and Granville Island Quay. Guess I'll have to wait till I get there and see how I feel.. does it sway? Another thing I like to do is to take the skytrain from Vancouver to New Westminister and go to the Quay there, the train could go further out now, I am not sure. It is a nice trip. Vancouver is very busy as far as traffic goes.